Think Outside’s Stowaway Travel mouse for Windows Mobile based Pocket PCs and PDAs connects with the mobile devices via Bluetooth. 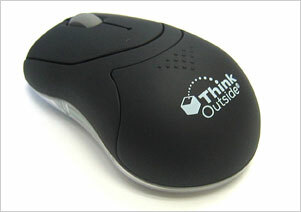 Thus, Stowaway Travel Mouse can also be used with any Windows XP or Mac OS X Notebook with Bluetooth. MTekk reviewed Think Outside Stowaway Travel Mouse and concluded “This is a fantastic little mouse it works extremely well and it’s very responsive, not only can you use it on your PDA but you can also pair it to any Bluetooth enabled PC or Laptop. I find I can also use it quite successfully in the car; I have my atom sitting in the holder on the dash and use the stowaway mouse by using my thigh as a mouse pad works quite well.